The Department of Nursing was established in 1974 for honing and amassing the skills and knowledge of nursing on the foundation of a harmonious development of the mind, spirit, and the body, the Christian faith, and inquiry based on scientific knowledge. The Department of Nursing operates undergraduate, master's, doctoral, and health and welfare graduate schools (clinical nursing: specialized nursing course), tumor specialization programs, elderly care programs, and the RNBSN course. The Ministry of Education approved this nursing program at SU in 1996. Since 1997, the program has been accepting 40 freshmen each year. The program is created for students expecting to graduate from a three-year nursing college and are working in the field of nursing. The aim of the program is to enhance student’s public health capacities, along with professional clinical knowledge and skills so that they may acquire a bachelor's in nursing. Physical therapy is the treatment of people who have had a temporary or permanent disability from diseases, accidents, or congenital disorders, by using exercise therapy or physical elements (water, light, electricity, heat, etc.) It is a specialized area of medicine that evaluates, treats, and educates to minimize or prevent injury. Based on science-based problem-solving and evidence-based education, the Department of Physical Therapy is responsible for treating physical ailments and disorders caused by various diseases and/or accidents in the modern world. We research treatment methods that are best of recovery of physical functions and rehabilitation. 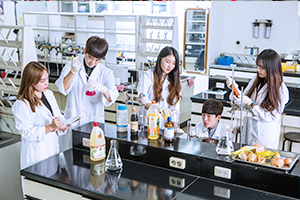 The Department of Food and Nutrition focuses on education for the health and development of the body, which is the basis for developing a balanced education of the mind, body, and spirit. The department fosters leaders who can contribute to the improvement of nutrition and health of people by acquiring scientific knowledge about food and nutrition. The world, including South Korea, is in need of an innovative smart welfare system to solve the traditional and rising social issues ranging from poverty and disease to an aging population and low birth rate against the backdrop of a worldwide low economic growth. Based on the belief of shared economy and the development of welfare technology, the Department of Social Welfare fosters a new level of specialized welfare professionals that converge intelligence with creativity. Health Management Studies is aimed at improving health and quality of life of individuals, groups, communities, and the world. Through coursework in public health, health education, health kinematics, communication theory, health policy, etc. students learn how to develop, plan, manage, and assess public health programs. In this severely competitive world, people are suffering from countless problems, injuries, and stresses. The Department of Counseling Psychology aims to cultivate professionals who can alleviate and better the harsh realities of life by providing expert services in psychological counseling. 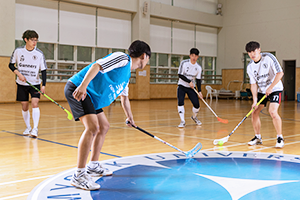 n keeping true to the educational philosophy of SU (a harmonious mind, body, and spirit), the Department of Physical Education interests itself in the scientific pursuit of developing and maintaining a healthy body. In addition, based on the spirit of Christianity, it aims to teach basic physical education (sports physical education, anthropology, sports education, anatomy, physiology, etc. ), clinical sports medicine (sports medicine and prescription exercise), sports nutrition (obesity, weight control programs, etc. ), body balancing (posture correction, etc. ), sports psychology (stress management, etc. ), and sports marketing (sports management, sports industry, etc.). It is our goal to produce professionals capable of managing the comprehensive health and physical fitness of others.